Tub Rail - Bathtub safety rail-high profile, 1" tubing with knurled safety grip finish, foam lined clamp attaches rail securely to provide sturdy support and won't scratch tub surface, 8" to 15" high and 17" wide. Fits all modern tubs wall width 3 1/2" - 6 1/2". 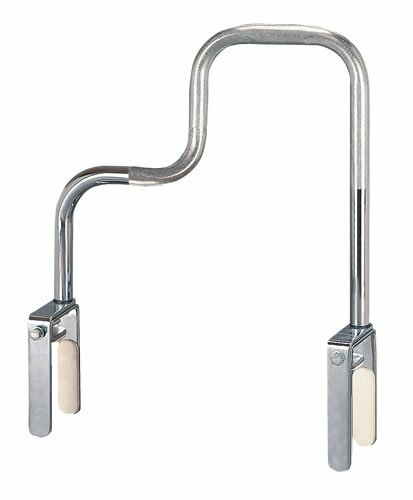 Bathtub safety rail-high profile, 1" tubing with knurled safety grip finish, foam lined clamp attaches rail securely to provide sturdy support and won't scratch tub surface, 8" to 15" high and 17" wide. Fits all modern tubs wall width 3 1/2" - 6 1/2".